Top left photo: James Policar (left), UW Medicine Advancement, Dr. Peter Esselman, Chair of the University of Washington Department of Rehabilitation Medicine, and Phil Devitte, recipient of the top 100 Safeco Insurance Agents, “Make it Happen in the Community” award. Top right photo: Todd Williams, Safeco Territory Manager for Washington and Alaska, with Phil Devitte. Bottom left photo: Dr. Esselman with Phil and his wife, Ellen. 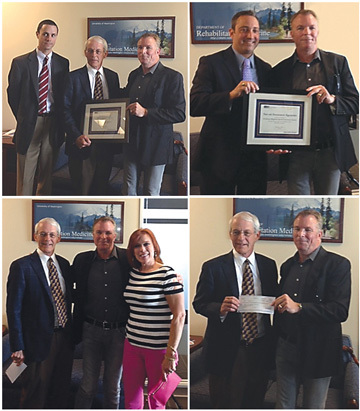 Bottom right photo: Phil Devitte presenting the $2,000 award check to Dr. Esselman. Safeco Insurance awarded Phil Devitte, co-owner of SAV-ON Insurance Agencies and author of Follow Your Heart, their coveted "Make More Happen Award" for his volunteer work with both children and young adults over the years. Phil, a spinal injury victim, devotes much of his spare time teaching others the importance of spinal health and safety, coaching them about risky behavior that can lead to paralysis. The award was presented by Dr. Peter Esselman, Chairman of the University of Washington Department of Rehabilitation Medicine. Also on hand were James Policar, UW Medicine Advancement, and Todd Williams, Safeco Territory Manager for Washington and Alaska. Safeco will be donating $2,000 to the charity of Phil's choosing: the Northwest Regional Spinal Cord Injury System. It is organizations like SAV-ON – and dedicated volunteers like Phil – that make our communities better places to live and work. Congratulations, Philip!